The taut title track is next, complete with tightly-orchestrated banjo strings, before both the drifting 'Far And Away' and 'If Ever' are rolled out. Listening to Indigo, as with all his musical works, in truth, it's clear Siegel is a terrific keyboardist and a strong composer. The music has its feet planted in the most radio-friendly of the smooth jazz tradition, but there is enough flair and adventurousness under the surface to keep the listener's interest. The uptempo 'Spur of the Moment' is along next, and complete with Lenny Castro's percussion and Craig Fundyga's vibraphone embellishments, the added textures add color add just the right amount of vibrancy at each and every noted turn. 'First Light' brings the tempo down to a smokey nightclub feel with the album rounding out with both 'Consider This' (which also comes across as a Part II to the previous track), and then finally 'Endless' bringing the album to a close. 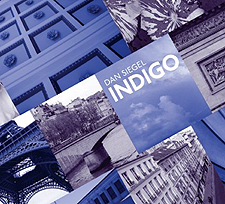 Simply put, Indigo is yet another resoundingly beautiful work of Dan Siegel art! The album presents an array of facets, each one displaying a portion of what's to come throughout. I look forward to exploring more of Siegel's works as we progress, although I hope he doesn't wait another five long years to do so!